These are the main mantras passed around today as career advice, especially to new graduates. While this is good advice for some as people do fall into a career or position that is their dream job, this isn’t the case for everyone. You can enjoy your job and not have it be your dream job. What the career gurus don’t tell you about your “dream job” is the reality of high stress in such a position. Stress is around you all the time, whether it’s trying to make a deadline or wrap up a surgery. Healthy stress can push you to do better at your job and be a better person. Negative stress is bad stress. Too much bad stress can impact you financially in more ways than one. 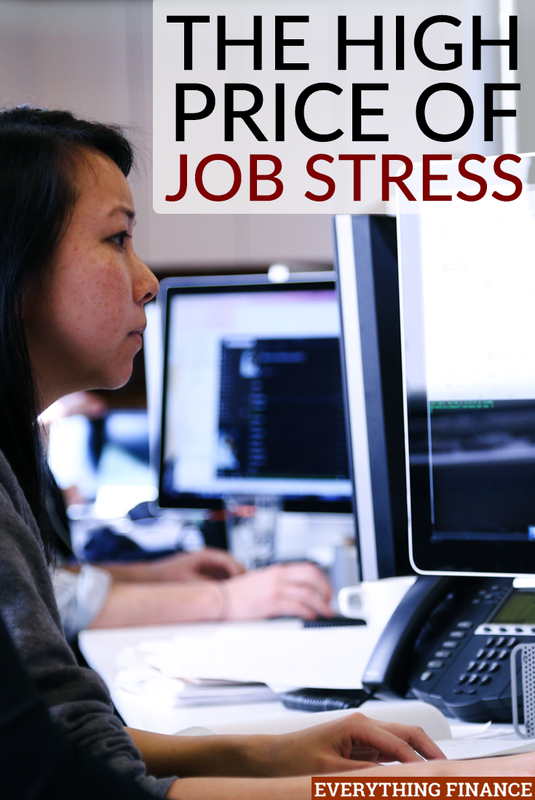 Here are some ways that job stress can cost you. We as human beings are emotional creatures. It’s how we empathize with one another and make relationships. You can have good emotional days such as celebrating a new client, a co-worker’s success, or spreading your own good news. Bad emotional days happen and everyone gets the blues now and then. But if you notice that you are down in the dumps more often than not, and you have to force yourself to go to work even though you can’t bear to get one more snarky berating email; that’s negative emotional stress. Emotional strain takes its toll on your body and on your performance. If you noticed your energy levels are down, most likely so has your boss and coworkers. If you aren’t performing as well it could lead to a serious talk that could lead to resignation or firing. Emotional distress is not good for you or for your career. If you noticed you are down in the dumps more, high negative stress can start to take an effect on the body. This is from a personal experience. I worked at a job I thought I loved. And yet I noticed my stomach would cramp more often and I would feel sick. I ended up spending more mornings at home than I thought. After I left that job, I haven’t had one sick day from stomach pains or cramps. It’s amazing what negative stress does to your body. Increased visits to the doctor and days spent home add up and can start costing your wallet. If you have that one client that demands you answer them at all hours, or a manager or boss that feels the same way, you aren’t going to perform at your best. The stress of answering that ringing phone will add up and you will subconsciously start moving away from the project. If the client thinks you aren’t playing fair, that could cost you money or a raise if taken off of the account. A client could take their services away from your company, and if you were the one performing poorly, it could be viewed as your fault. This could cost you a lost promotion or raise, or even end up costing you your job. They say you shouldn’t bring work home with you, but everyone knows that it still happens. You vent about your day to your spouse, friends, partner, etc. That’s what we do. If you are extremely stressed out, you might not vent about it, but you might take it out on your loved ones without meaning to. If you are unhappy with yourself, you’ll most likely take it out on your loved ones by making them unhappy. Leaving a negative and stressful work environment to go to a stressful home does no one any good. Being around unhappy people day after day wears on a person, and in the end hurts you the most. If you are feeling this way about your position and you can’t shake that feeling of dread, listen to yourself. We have a gut feeling for a reason. Ingesting a toxin or poison hurts you and cost you money – it’s the same with a toxic environment. Negative people try to bring down those around them. You can’t put a price on mental health and emotional well-being. With an increased awareness of mental health, there is no reason for you to tolerate a toxic work environment. A distressed mental state plus poor job performance equals a negative stress atmosphere. It’s scary to leave a negative or high stress position. There is a lot of negative backlash from the constant state of alert. I learned this the hard way from my first “real job”. I thought I had a dream job, or at least found a dream company. They had a decent work culture, neat clients, and a great benefits package. I thought I had it all. I didn’t and it took a while to realize I was in a high stress position that was not good stress. I cried almost every evening on the way home. I jumped at my phone and got severe stomach cramps thinking about the next day. The day I resigned was the day all my emotional and physical symptoms disappeared. I’ve had my ups and downs since, but nothing like that first position. Listen to your gut. It’s okay to not be passionate or love your job. You don’t have to find your passion right away. Take your time, explore, and find new options and opportunities. But, you also need to be smart about your finances. If you are thinking about resigning and finding a new job, be sure to put money aside to live on, especially if you resign before getting a new job. Find what motivates you in a position and pursue that. Maybe switching departments would do the trick or moving to a different branch of the same company. Do what you can to find and lower workplace stress. Be smart about your decisions and watch your budget. Go find your passion, but know that it doesn’t have to be your job. Have you ever experienced any of these consequences of high stress? Can you think of other costs you encounter with a stressful job?